The United States Army fought subterranean battles in the tunnels of Vietnam. Following a few tear gas grenades or a charge of C4 plastic explosive, "tunnel rats" would go underground to find Viet Cong or North Vietnamese combatants or materiel. Small, slender soldiers, armed with a flashlight and a .45 caliber pistol, would crawl into the Vietnamese tunnels for reconnaissance and possibly close combat. Almost all of the Vietnam-era tunnel rats have left active duty by now, but the need to train for this type of underground combat remains. The US Army's experience was not unique. From 1979 to 1989, the Soviet 40th Army waged war against the Mujahideen in Afghanistan. Part of this war was fought in the tunnels of Afghanistan, which were larger and far more extensive than those of South Vietnam. The karez have another use. Since ancient times, these underground waterways have been used by the villagers for shelter against invading armies. Accounts of the chroniclers of Afghan history in medieval times refer to the use of the karez by civilians, as well as combatants, during the invasion of Genghis Khans's Mongol armies in 1221 A.D.. The Mongols set out to destroy all major cities in Afghanistan and the neighboring area and made every effort to massacre the inhabitants to the last man. (5) The Mongols did not go into the tunnels after the refugees. Rather, a day or two after destroying the town, the Mongols would send a small detachment back to the area to cut down the resurfaced survivors. They did this to insure that no potential resistance against Mongol rule remained. The Mongols learned, during their initial campaigns, that the official surrender of a city does not guarantee the permanent submission of the area, since the inhabitants would often rise against the invader, once his main force had moved on. In the mid-1980s, the Soviets ran a tunnel neutralization course in Paghman Province some 14 kilometers to the northwest of the capital city of Kabul. The course was designed for Afghan special forces soldiers and was similar to courses run for Soviet sappers in Afghanistan. The school was necessary since men do not readily go underground to fight. 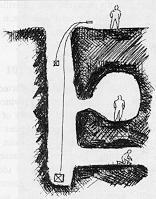 Tunnels are ideal locations for a booby trap, a knife thrust from a side tunnel and cave-ins. (7) Further, tunnels teem with snakes, scorpions and other creatures. (8) After a quick course in theory, the tunnel neutralization course moved out to the field for practical application. The search group was armed with knifes, entrenching tools, hand grenades, pistols, and assault rifles. (17) A flashlight was taped to the forestock of the automatic rifles. The magazines of the assault rifles were loaded with tracer ammunition. Digging the enemy out of tunnels appears to be a constant in guerrilla warfare and the combat engineer always seems to be the first one called for the task. Differentiating innocent civilians from combatants underground will also prove a challenge for combat engineers. Underground combat will not disappear from the future battlefield. In the quest for high-technology answers to the complex problems of tomorrow's battlefields, there are few high-technology solutions for underground combat. After all the charges are blown, determined soldiers still have to go underground to meet equally determined opponents. Specially-trained soldiers will be better prepared to cope with future subterranean combat, but subterranean combat remains the realm of raw courage, cunning and nerve. 1. Karez is the Pashto term for the manmade underground water system. Qanat is the Arabic term used in Iran and Afghanistan. Louis Dupree, Afghanistan, New Delhi: Rama Publishers, 1980, 40. Diagram 1 is from page 41 of this book. 3. A. Bek, "Smertel'naya volna: Podzemnaya voyna v Afganistane" [Deadly wave: Underground combat in Afghanistan], Soldat udachi, [Soldier of fortune], November 1994, 4. 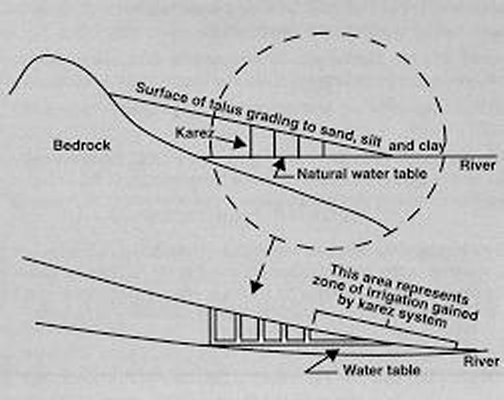 This article is based on Colonel Bek's article and diagrams 2, 3 and 4 are Colonel Bek's. 5. Ali Jalali, The Military History of Afghanistan, Volume 1, Kabul, 1964, 437-442. 6. Accounts of Mujahideen commanders from Ghazni Province made to Ali Jalali in 1984. 7. Bek, 5. Lieutenant Colonel Bek ran this school. 8. Afghanistan has two species of cobra, the deadly krait and many types of vipers. Dupree, 53. 9. Most Afghans would state that they seldom, if ever, gave warning. 10. 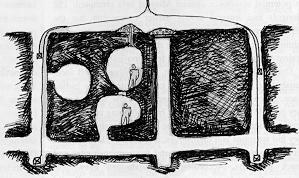 Fragmentation grenades, such as the cast-iron body Soviet F-1, are fairly ineffective underground. 12. The Italian TS 6.1 mine has some six kilograms ( 13.2 pounds) of explosive. Soviet engineers often used a box of TNT in lieu of a mine. 17. 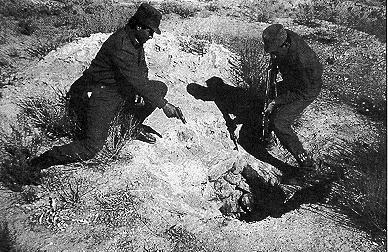 The entrenching tool was a weapon of choice for Soviet soldiers in hand-to-hand combat. Elite forces normally kept a razor-sharp edge on their entrenching tools. 19. Terry J. Gander and Ian V. Hogg, Jane's Infantry Weapons 1995-1996, Surrey: Jane's Information Group Limited, 1995, 203-204. 20. 20 Russian General Staff material that Mr. Grau is currently translating and editing for publication. 21. Mike Barry, International Afghanistan Hearing, editted by the Committee for International Afghanistan Hearing, Oslo, 1984 as cited by M. Hassan Kakar, Afghanistan: The Soviet Invasion and the Afghan Response, 1979-1982, Berkeley, 1995, 234-235. 22. State Department Special Report # 106, Afghanistan: Three Years of Occupation, Washington: US Government Printing Office, December 1982, 5.